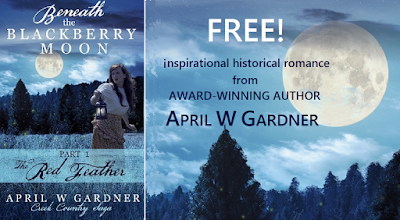 Home > featured book > FREE Historical Romance! Scroll to nab your copy! Beneath the Blackberry Moon will sweep you away to another time, then make you sigh and wish you could stay just a little longer. I cannot put this book down! April Gardner crafts the scenes and character interactions so well, you are there! What a powerful story. This newsletter goes out only a handful of times each year to announce new releases, so no worries--your inbox won't be bombarded. April is generous to her email subscribers. Next month, each will receive another novel, absolutely free! See below to learn more about Better Than Fiction. But what woman would have a warrior whose blood-soaked hands destroyed her life? Then again...does she have a choice? In 1916 Corona, California, motorcars are all the rage, and racing them is what Meghan’s hero, Russell Keegan, does best. But when his competition vandalizes his car, the only mechanic available is a greasy woman in a man’s overalls. After a racing accident claimed her father’s life, Winifred became the sole breadwinner for her family. She is disdained as a female mechanic, but her daddy's trade is all she has left. Can she swallow her hatred of the races and take up Russell's offer of big bucks to fix his car, or will she lose everything to mounting debt? Under Meghan's skillful pen, these two embark on a thrilling, adventurous romance. But she finds that writing those love scenes with Curtis’s face in mind takes her heart places it shouldn’t go. Will she realize in time that real life can be better than fiction?